Youngstown, Ohio – The Youngstown State football team scored the first 21 points of the second half and had four different players rush for a touchdown in a 38-24 victory over Samford in the first round of the FCS Playoffs on Saturday evening at Stambaugh Stadium. In winning their 15th consecutive home playoff game, the Penguins advance to play No. 3 Jacksonville State next Saturday in the round of 16. Youngstown State is now 9-3 this season. After playing to a 7-7 deadlock through more than 29 minutes, Youngstown State scored 24 points in the next 19 minutes to take a 31-7 lead on the Bulldogs. YSU's Zak Kennedy kicked a 25-yard field goal with three seconds left before halftime, and the Penguins scored touchdowns on their first four drives of the second half. Jody Webb ran for a career-high 174 yards on 27 yards and scored twice, and Martin Ruiz rushed 15 times for 78 yards and a touchdown. Tevin McCaster and Shane Kuhn also ran for scores for Youngstown State, which outgained the Bulldogs 289 yards to 24 on the ground. Hunter Wells was 8-for-12 passing, and David Rivers led a defense that held the Bulldogs 12 points below their season average with eight tackles. Samford had 10 points with just over seven minutes left before adding two touchdowns when the game was already out of reach. Devlin Hodges passed for 372 yards and three touchdowns – all to Kelvin McKnight - on 51 attempts for Samford, which ends its season with a 7-5 record. Youngstown State never trailed in the game and scored on its second drive of the night to take a 7-0 lead on the Bulldogs. An eight-yard Webb run gave the Penguins first-and-goal at the 4, and Kuhn's one-yard scoring plunge came on third down. Zak Kennedy, back from a two-game injury absence, added the extra point to put YSU up 7-0. Samford answered immediately on its next drive when Hodges and McKnight connected for their first of three touchdown passes. Hodges passed for 72 of the 74 yards on the drive, and the final 19 came on the scoring strike to McKnight with 1:57 left in the opening quarter. YSU was able to maintain positive field position behind punter Mark Schuler as the defenses took control in the second quarter, and the Penguins took over on the Samford 34 with 3:45 left before halftime. Youngstown State drove down to the 8 before settling for Kennedy's 25-yard field goal with three seconds left. Youngstown State's offense took control of the game in the second half, setting the pace in the third quarter with 22 plays for 179 yards that took up 12:21 of the 15 minutes. Webb returned the second-half kickoff 48 yards, and Wells hit Kevin Rader on a 41-yard pass on the first play from scrimmage to advance the ball to the Samford 8. McCaster scored from the 1 three plays later, and the Penguins had a quick 17-7 lead. The YSU defense forced three straight incompletions on Samford's possession, and the Penguins used a 12-play drive that took 6:49 off the clock to go up 24-7. Ruiz ran for 20 yards on fourth-and-one to advance the ball to the Bulldogs' 31, and an 18-yard pass from Wells to Webb on third and six gave the Penguins first-and-goal at the 9. Ruiz scored from the one three plays later. Webb's six-yard touchdown run on the fifth play of the fourth quarter put the Penguins up 31-7, and it ended an 11-play, 81-yard drive that lasted 6:35. Samford quickly moved the ball down to the YSU 3 in 1:37 on its next drive, but the Bulldogs had to settle for a 20-yard field goal. 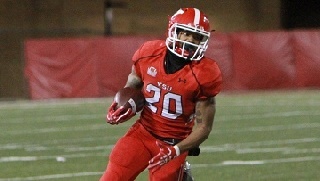 Webb scored on a 62-yard run on the second play of YSU's ensuing possession to put YSU ahead 38-10. Hodges and McKnight connected on touchdown passes on Samford's final two drives for the final score. Youngstown State will play at No. 3 Jacksonville State in the second round of the FCS Playoffs next Saturday. Kickoff at Burgess-Snow Field at JSU Stadium is set for 2 p.m. Eastern.